It is Thursday morning as I write this, [July 28], and time keeps moving on faster and faster it seems. The wedding is tomorrow in a week! It’s getting too close for comfort! Tomorrow evening the wedding cook wagon, the cooler, and the trailer with the tables, dishes, etc. will arrive. Saturday Mose’s family, Jacob, Emma and family, Verena and Susan (my sisters), Timothy and Elizabeth, and a few friends will come help set the tables for the wedding in the pole barn. The wedding wagon comes with a 350-place setting. We finished and insulated the other part of the pole barn so we can spread out the tables a little more. It seems you can never have too much space. I still need to go shop for a lot of groceries. My list keeps getting longer and longer! It will be a relief once we have all the groceries. It’s easier to wait to get the groceries until the walk-in cooler and cook wagon are here so that we can put everything in there. Joseph, Lovina, and Kevin are washing down the walls in the pole barn. Verena and Loretta will clean the windows once they finish their list of things to do in the house. My list of cleaning keeps getting smaller and smaller. 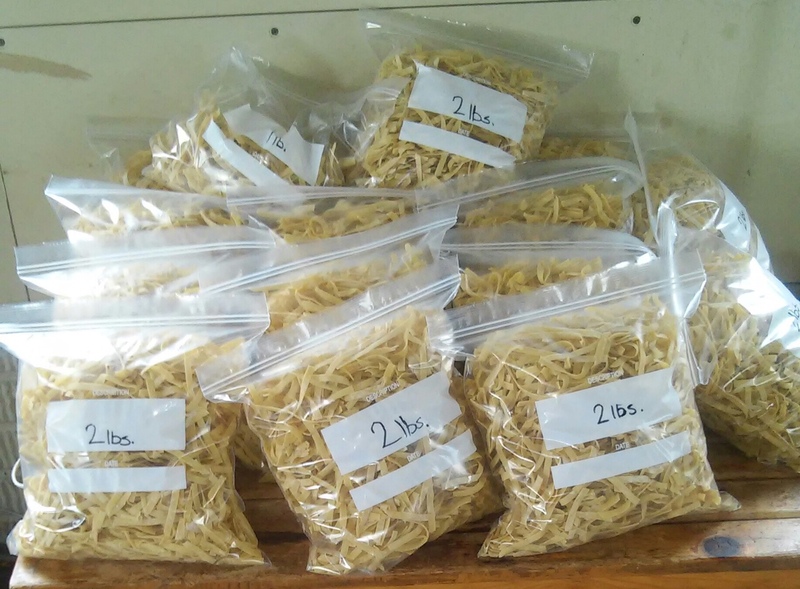 On Friday, sisters Verena, Susan, and Emma, and daughter Elizabeth came to help put 228 eggs into noodles. We have over 30 pounds of noodles made for the wedding now. On Saturday, Timothy, Elizabeth, and sisters Verena and Susan came again to help. Verena and Susan had the pleasure of cleaning the boys’ bedroom. Daughters Verena and Susan and I were organizing drawers, the closet, etc., and trying to stay ahead of my sisters. The room looks so much better but I wonder for how long. It should stay cleaner after the wedding since Benjamin will move all his things into Susan’s bedroom. With just Joseph and Kevin’s things maybe it will stay more organized. Kevin has a bad habit of collecting everything, which doesn’t help. Joseph still didn’t get a birthday cake but we have been so busy. Joseph said he can wait until after the wedding if we don’t find time before, but hopefully Sunday we will be able to. I don’t know what we would have done without Joseph’s help. He has done so many jobs for us that the girls and I couldn’t do. Yesterday Mose’s mother Rosanna, his sisters Hannah and Linda, his sister-in-law Suzanne, my sister Emma, and daughter Elizabeth assisted us in our work. Hannah has four little children and Suzanne has a little boy. She also brought along Mose’s sister LeAnna’s little girl. Kevin and Steven helped keep the little ones entertained. Mose was here helping all day, too. He started a new job at an RV factory today. I hope he will like it. It will take a lot off him not to be running after saw mill parts all the time. My neighbor Susan came over to help me get my grocery list ready and help see how much of everything I need. She took the pants I had cut out for Kevin and said she will get her daughter Barbara to sew them. I really appreciated that! I have my dress sewn and this afternoon I want to sew my cape and apron. Daughter Susan was off work yesterday. She somehow hurt her shoulder and was having a lot of pain. She was still sore this morning but said she can’t miss another day. I really hope she doesn’t make it worse. She has an appointment after work today to get it checked out. Hopefully it will heal quickly. I must get back to my work. Take care everyone and God’s blessings to all of you! Try this cabbage sausage soup with cabbage out of your garden. Bring water, soup base, cabbage, and onion to a boil. Reduce heat; cover and simmer until cabbage is tender. Halve sausage lengthwise and slice. Add sausage and heat through. Combine flour, salt, pepper, and milk in a gravy shaker. Shake until smooth; gradually stir into soup. Bring to a boil; cook and stir until thickened. Add cheese to taste. Congratulations Susan and Mose. I know that marriage is not always a bed of roses but it is worth the work. Susan, knowing your mom, several of your aunts and the honor of knowing your grandma Elizabeth I know you have several fantastic role models. God bless Mose and your marriage. How very special for them to hear from you, Amanda. Thanks for the comment and the blessing! What do the wedding wagons look like inside and outside. How is the refrigeration powered? How are the ovens and stoves powered? How big are they? Let us know if you can’t access that photo album.